Tim Pavish (left), executive director of WSU alumni relations and WSU president Kirk Schulz present Guy Palmer (middle) with the WSUAA Alumni Achievement Award. 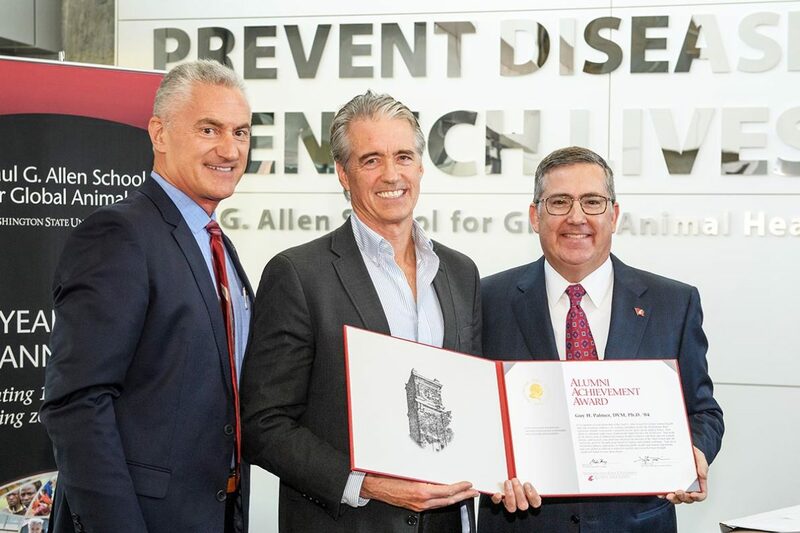 Guy Palmer, D.V.M, Ph.D., Regents Professor of Pathology and Infectious Diseases, was honored Sept. 28 with the Washington State University Alumni Achievement Award. The award recognizes and honors alumni who have given significant service to WSU and outstanding contributions to community and profession. Palmer completed a residency in pathology and a doctoral degree in infectious disease at WSU in 1984. Ten years ago, WSU established the Paul G. Allen School for Global Animal Health where Palmer served as founding director. Palmer received the award at an event hosted to celebrate the school’s 10th anniversary in September. A member of the National Academy of Medicine, Palmer currently serves as senior director of global health at WSU and holds the Jan and Jack Creighton Endowed Chair in Global Health. Under Palmer’s leadership, the Allen School has advanced from a vision into a preeminent research institution. Outstanding faculty recruited from world-renowned universities have grown external research funding from zero to more than $10 million annually. In addition, a recent award received from the Centers for Disease Control and Prevention (CDC) places WSU as the number one recipient among all US colleges of veterinary medicine. The WSUAA Alumni Achievement Award was created in 1970 by the WSUAA Board of Directors to recognize alumni who have given outstanding service to WSU and made contributions to their professions and communities. The award is the highest honor bestowed by the Alumni Association.